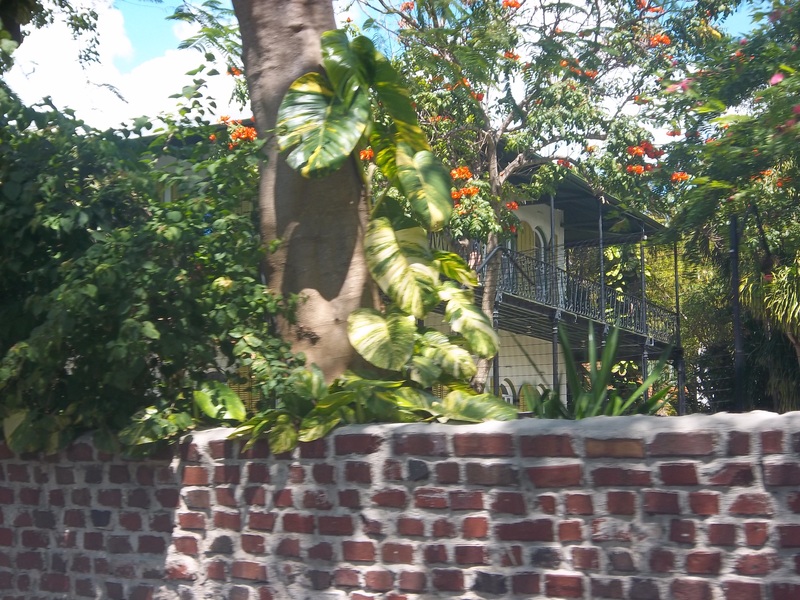 One of the places we visited last week while we were at Key West was the Hemingway house. Ernest Hemingway lived there with his wife Pauline for about 9 years in the 1930’s. (All of the facts listed in here came from the tour guide. I hope I am remembering them correctly.) This is the approach to the house from the side. We came to the house this way because parking is a premium in Key West, and we found a lot about four blocks away, just after the intersection of Whitehead and Southard Streets as you head towards the Atlantic ocean, where you could park all day for $20, and he would let you drive away and come back to the lot later in the day. This chandelier came from Europe and includes Venetian glass. Pauline shipped it from Europe to use as a centerpiece of the house, and apparently it was the talk of the town once it was installed. 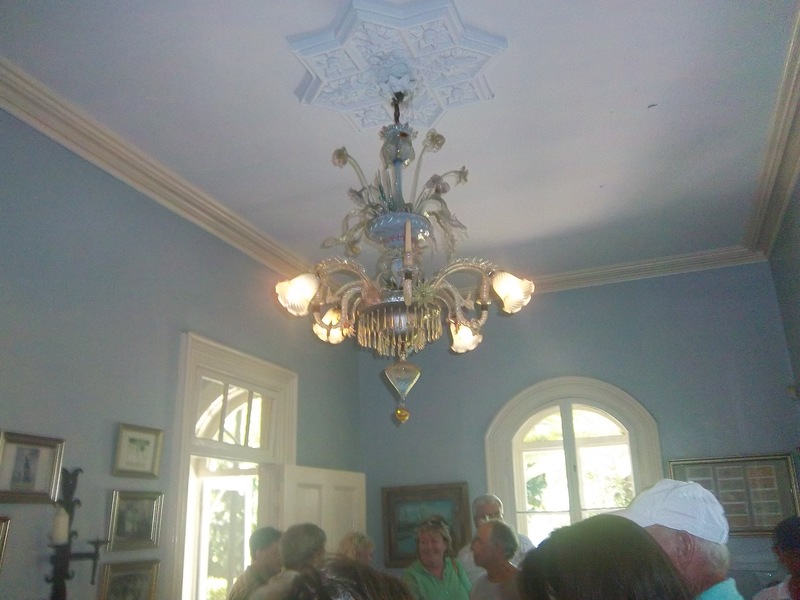 The house was originally built by a doctor, who paid to have the limestone coral base rock excavated to provide the only full basement in the city of Key West. It sits on a full acre of land, which also makes it one of, if not the, largest homesteads in Key West. 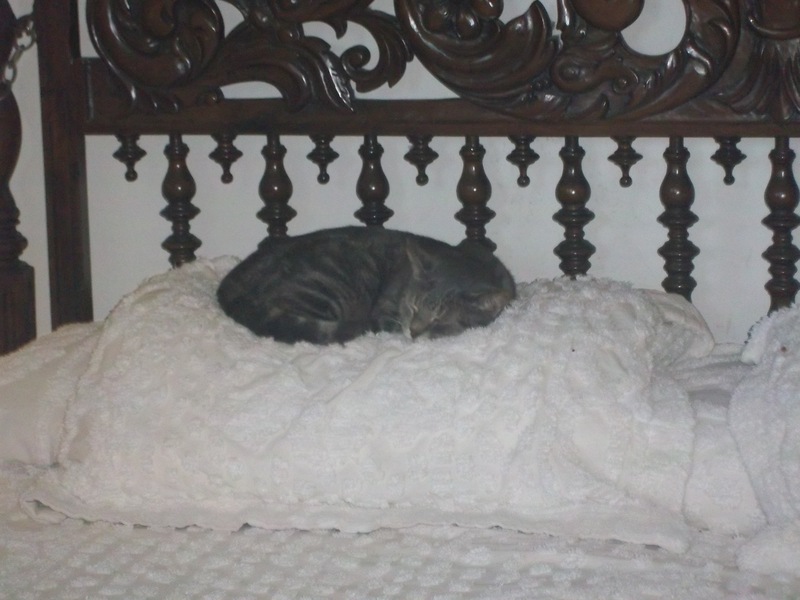 In the master bedroom, our tour group found Frances the cat comfortably curled up on the pillows at the top of the bed. Yes, Frances really is her name; our tour guide told us that she was the least interactive among all of the cats at the house. Laying there asleep in the master bedroom is as close as she gets to interaction. The upstairs hallway, although a little narrow, is lined with bookshelves on one side. 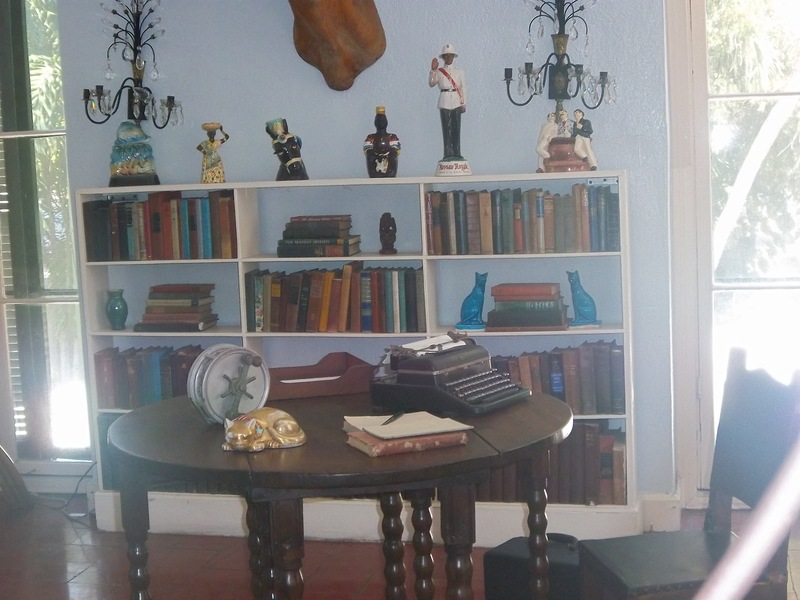 These books are not necessarily the ones that were in the house when Ernest Hemingway lived there, but they are books he owned and used or books given to him as gifts. 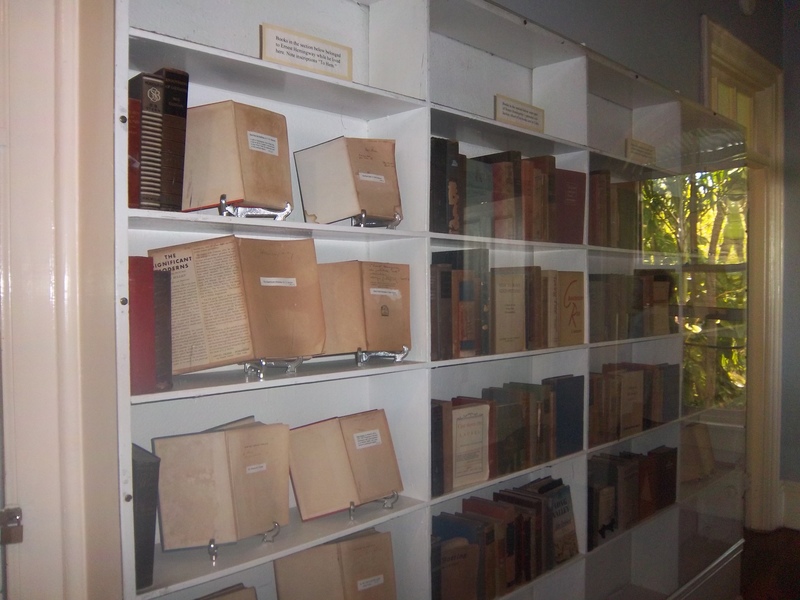 He had an estate in Cuba after he left Key West around 1939, and he kept most of his books there. Unfortunately, the estate was confiscated by Castro after the Bay of Pigs invasion. There is a huge veranda that wraps around the outside of the house on the second floor. Mark took this picture for me. 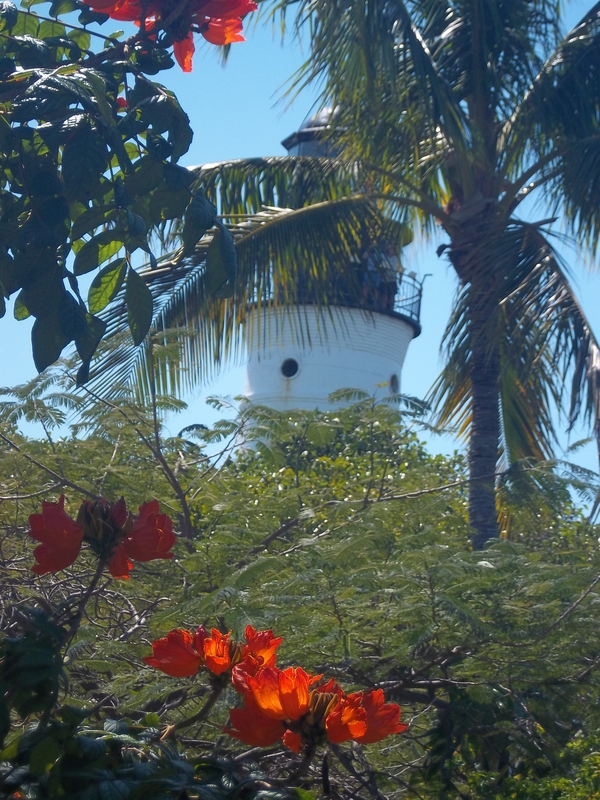 On the front side of the veranda, you get a wonderful view of the Key West lighthouse through the branches of the African Tulip Tree on the house grounds. The African Tulip Tree, as you might tell from the name, is not native to the Keys, and in the city of Key West they are rare. The flowers on it are striking. Behind the house is what used to be a coach house and barn. 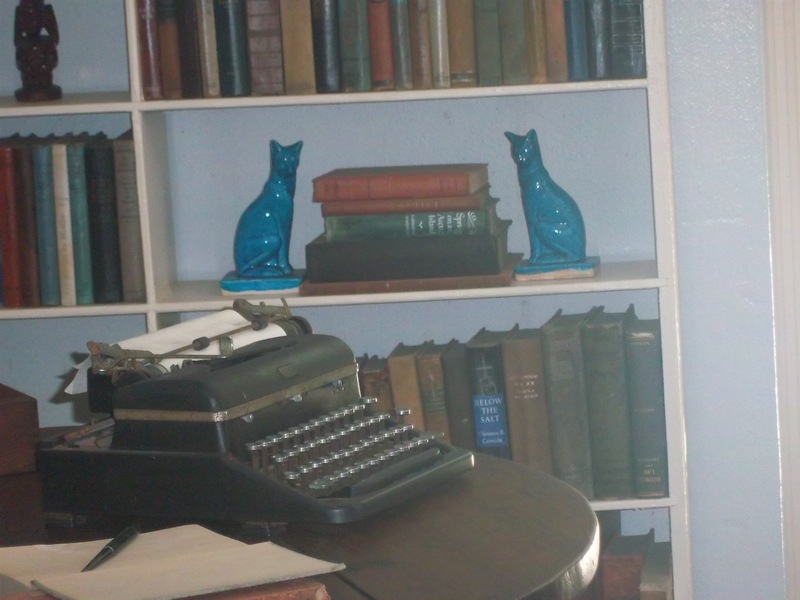 When the Hemingways moved into the house, they converted the top floor into a writer’s studio, the first one Ernest Hemingway had. He was a very disciplined writer, and would go out there every morning to write. I just had to take a close-up picture of the typewriter in the studio that he used to write on. From a writing standpoint, I felt that I was standing on hallowed ground and I admit I was hoping that somehow wafts of inspiration and writing talent would descend upon me while I was standing there. The most important thing I learned from the tour was simply to write every day. Period. Of course, it helps to have something to say, too! 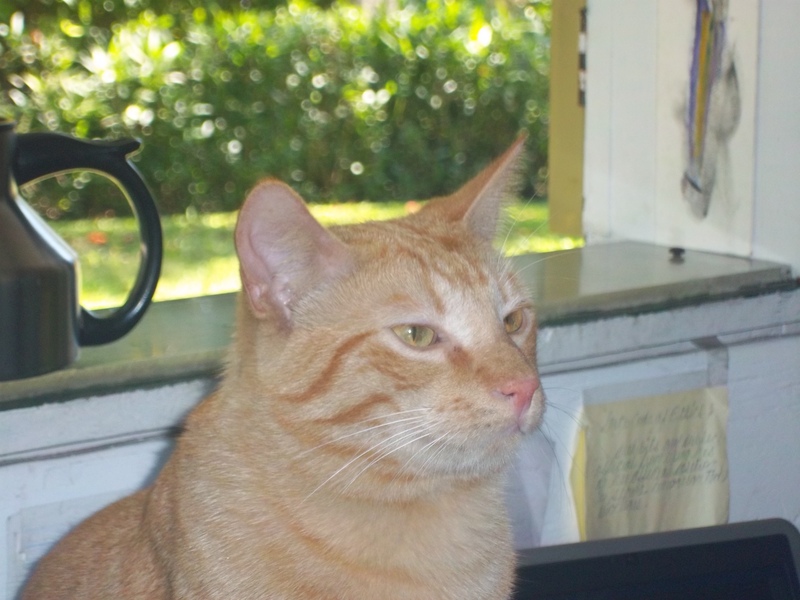 One of the cats had found its way into the writer’s studio (human visitors can only view the studio through a piece of clear plastic, but the estate owners left an opening large enough in the bottom of the barrier for the cats to get in.) He or she looked quite comfortable. 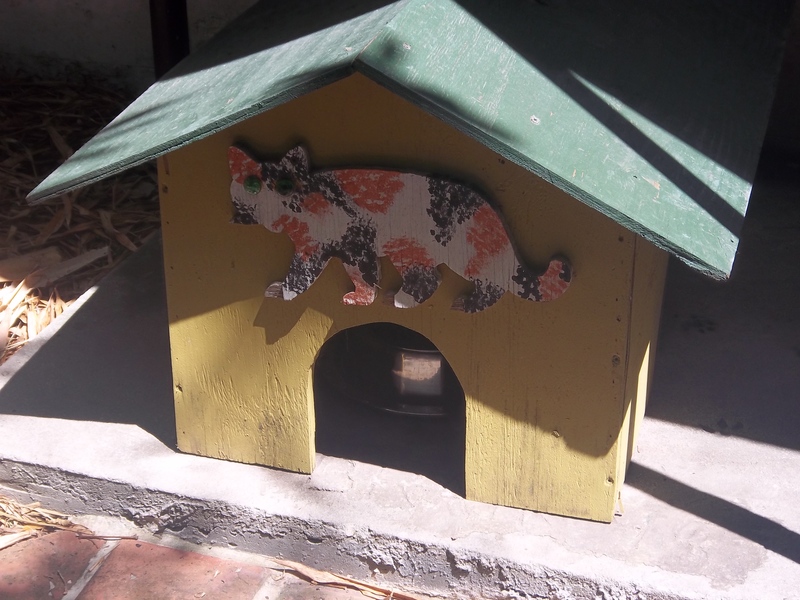 The estate has several areas where food is put out for the cats, and this was one of them. It is between the house, and the writer’s studio and pool. None of the cats were around it at the time we were there, but I am sure it is a frequent haunt of theirs! Finally, since I was there as a tourist, and not thinking about blogging at the moment, I neglected to take a picture of the pool, but it is a beautiful salt water pool put on the grounds by Pauline. It cost $20,000 to build in the 1930’s. The dollar equivalent today I cannot even begin to calculate. The reason it was so expensive is the hard coral bedrock of the island. It took an extraordinary amount of manpower to excavate the bedrock out in order to put the pool in. According to the tour guide, Pauline put to pool in while Ernest Hemingway was off on a trip somewhere. When he came back, he tossed a penny in the pool, telling her that she might as well have his last cent, too. She took it with good grace, given that it was her family’s money that paid for the pool, but kept the penny. The same penny now is covered by plexiglass on the pool deck. Now a confession – I really can’t remember much about Hemingway’s writing, since I haven’t read anything of his since high school. I do remember he had a spare writing style that let a few words do a lot of work. However, my curiosity was piqued, so after we got back from Key West I hopped onto my trusty Kindle and downloaded two of his books that I hope to get to read sometime soon. I really, really enjoy my Kindle, but that is a topic for another day! 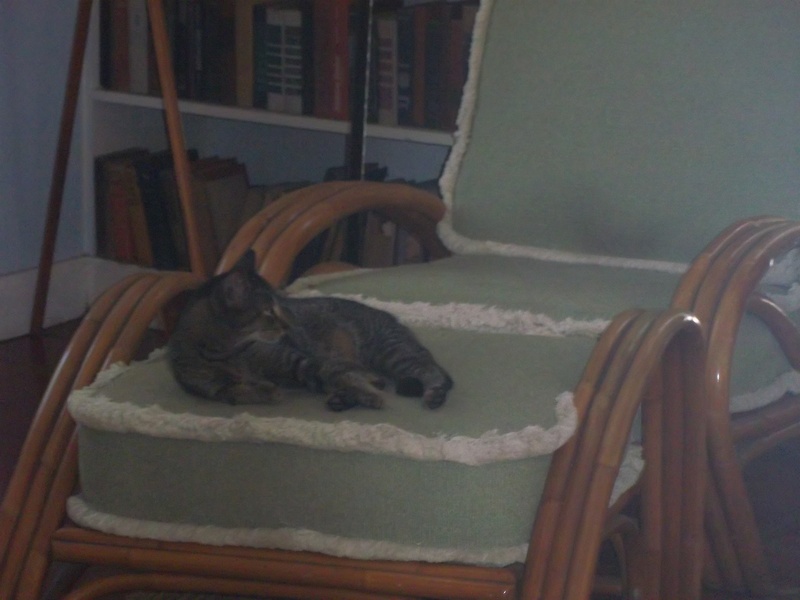 This entry was posted in Travel and tagged cat, Ernest Hemingway, Key West, parking, travel, tulip tree, writing. Bookmark the permalink. Thanks! I can’t wait to see your poem. I bet it is funny! Did you choose Hemingway or Salinger? I love my Kindle too! I guess we’re back to the separated at birth thing then! I love this story. You are having a great adventure. I know that your daughter will have a lifelong memory from this trip. Sometimes the best memories are from when we are that age. I know mine are. Yes, it was a great trip/adventure, but our daughter was not there with us. She was having the time of her laugh at her grandmother’s house. We do intend to go back with her one day, though. I am glad you enjoyed the post. Wow, this is so neat. I would LOVE to visit his home and witness where his magical writing took place. Thanks for sharing; I learned a lot! I’m glad you did! It was well worth seeing.